From the Dogpatch neighborhood of San Francisco comes Dogpatch Junction, a hot new jam band with roots in rock, jazz, folk, and blues. Steeped in the rich, complex music of the Grateful Dead, the band pays homage to their musical idols with dynamic improvisation and extremely danceable grooves. Featuring David Tchack on keyboards, David Appelbaum on bass, Zach (do you mind if we call you David?) Briefer on drums and vocals, Sharon Laveson on vocals, and special guest David Gans on guitar and vocals, the band has great chemistry and knows how to get funky. Tune in, turn on, and definitely drop by – Dogpatch Junction is waiting to take you away! United by a love for the music of the Grateful Dead, the musicians of the Sycamore Slough String Band gathered in an Oakland recording studio early this year to discover where the music would take them, and where they would take the music. One result is their new album, First Rehearsals, “a superb collection of mostly Dead covers,” in the words of the Grateful Dead Archive blog. The album “showcases the magic that can happen when fine musicians well-versed in the Dead’s unique approach to small group improvisation get together to play their favorite tunes from the Grateful Dead songbook. 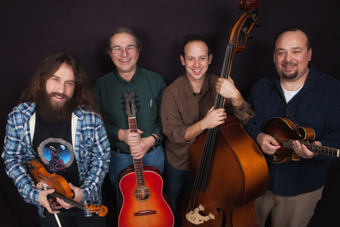 The band’s bluegrass/newgrass arrangements tease out new layers of meaning to chestnuts long familiar to Deadheads, making this one of the most exciting revisits of Dead music in many years.” With David Thom on mandolin, guitar, and vocals, Fiddle Dave Muhlethaler on fiddle, mandolin, and vocals, Roger Sideman on bass and vocals, and David Gans on guitar and vocals, the band boasts four sterling musicians, each with a gift for exploring, jamming, and sharing a collective vision. Warning: it’s the summer solstice and there’s a chance of having five Davids on stage at once. In the event of “cryptical envelopment” please stay calm and remember to breathe.